Well, I'm off to Wizard World Chicago today. In the past, I've set up in the artist alley to sell the minis, but it's never been too successful an endeavor, as you can imagine. Wizard World is a big super hero show, so the audience isn't exactly what I'm after, however, it's so close and since there isn't a small press show here, I do it for the sake of it. Well, I decided to save my money and skip it this year, but I will attend to say hi to some people and maybe hand out some comics. So, I do finally have the new issues of Burning Building Comix #3 and #4 finally available! They aren't up on the website yet, but they are printed and ready to go. So, even though I'm not making super hero comics, and I'm supposed to hate fan boy cons, I do enjoy taking in a big show. Mostly I like looking around at all the new stuff, the toys, and comics, and I love seeing little kids dressed up as superheroes. 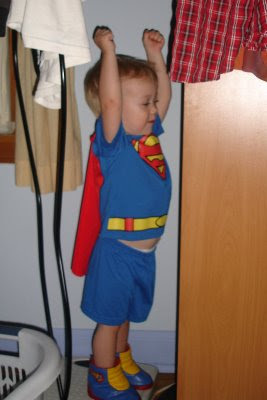 And speaking of which, Van has some superman PJ's and he thinks he looks pretty darn snazzy when he's all dressed up. Back to the Ipod three song random shuffle. I don't know what happened to Live. To me, they were so good for three or four albums, but then just fell off completely. One of those weird things, I guess, but then there's the idea that it's a band from my youth, and maybe I just outgrew the music. I think they just got too pretentious. Still, I love the cool guitar sound on Lakini's Juice and even if they were pretentious by this point in their career, I can always appreciate just the right amount of pretension. I used Firestarter as a song on one of my video pieces for Burning Building Comix. I think The Prodigy is still around and kicking, and I'll have to get around to checking it out at some point to see if they still have the sound. And Garbage again. Anyone that's ever read this blog before knows my love for that band. Cup of Coffee is a nice slow, sad, song, and for whatever reason, sometimes those make me feel best. By the way, the Cubs - Sox series is killing me! These games are too intense, and I'd rather go without them. Even though the Sox go for the sweep tonight, with the potential to tie up the season series.